On October 26, 2008, Helene Marilyn Cody passed away on her 16th birthday from a brain aneurysm. She touched so many people with her warmth and generosity. She was beloved by her family and many friends. She had such a giving personality that manifested itself in all the service work that she performed. She loved and excelled in her school work and running at Princeton High School. It is our hope that the warmth that Helene shared stay with all who have been touched by her. We will remember Helene for the rest of our lives. Helene's legacy is continued through the organs she donated to save the lives of many children, and through the work of the Helene Cody Foundation. Japanese legend has it that when one makes 1000 paper cranes, they can make a wish and it will come true. One of Helene's closest friends, Audrey Tseng decided that while Helene was in the hospital, she would make paper cranes in hopes that her wish would come true and Helene would recover. 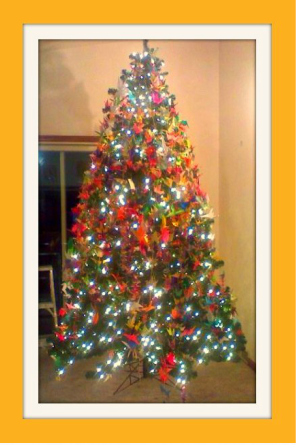 As her idea spread, many people in the community decided that they would make cranes to contribute to the project and because they felt it was a therapeutic way to channel their feelings during the tragic time of Helene's illness and death. Friends, family members, and students at Cranbury School & Princeton High School pitched in on the goal to make one thousand paper cranes for Helene. At Helene's funeral service, there were over 3000 paper cranes. After the funeral, thousands more were made and given to the Cody family. A display with some of the cranes was made by Helene's family and friends and donated to the Pediatric Unit of the University Medical Center of Princeton as a beautiful and inspiration piece of artwork for their playroom.